We supply a wide range of Coffee Sugar Canisters. 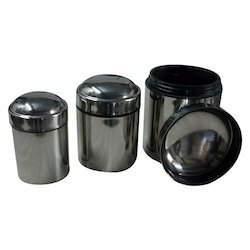 These finest quality coffee, sugar canister sets are widely used by todays generation. We manufacture a wide range of Tea, Coffee and Sugar Canister. These finest quality tea, coffee, sugar canister sets are widely used in today's generation. Our offered assortment of beautifully crafted by our dexterous craftsmen in order to meet the diverse requirements of our clients. We offer premium quality Coffee Tin Canister (Item Code : RSI-TC-03) which is used to store beverage and keep it steaming hot. 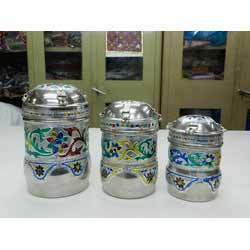 Made from steel material the Tin Canister offered by us has carved niche for them in the market. - Size Available : 7" to 9"
- Weight Per Set : 0.420. Size: 9 - 10 cm.